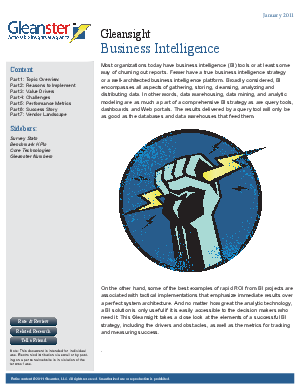 Most organizations today have business intelligence (BI) tools or at least some way of churning out reports. Fewer have a true business intelligence strategy or a well-architected BI platform. Broadly considered, BI encompasses all aspects of gathering, storing, cleansing, analyzing and distributing data. The Vendor Landscape section includes company descriptions and analyst commentaries for 32 technology solution providers.